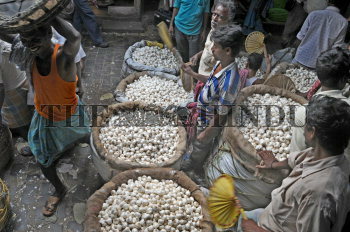 Caption : Kolkata: FOR AGRI PAGE: The woholesale garlic market is infull swing for last few days, due to fall in prices at about Rs.12-15 per Kg in Kolkata. The locally produced garlic has flooded the market here and buyers have been cheered up with the good variety available at low cost. Photo: Arunangsu Roy Chowdhury March 17, 2009.